Google AdWords offers a helpful and incredibly insightful report that shows you what the actual search terms people searched that triggered your ad. 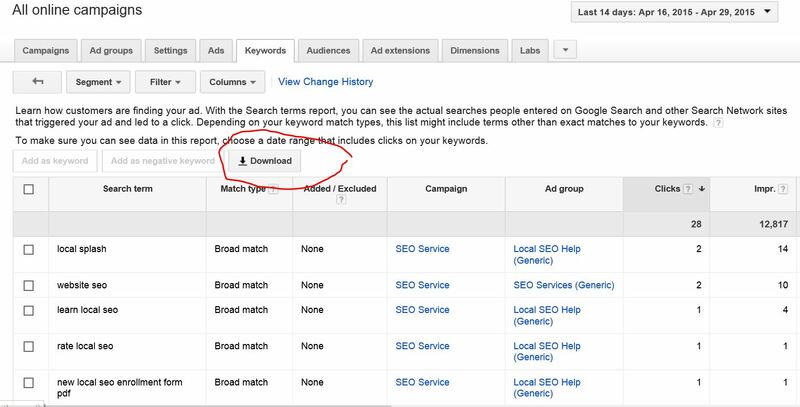 You are able to use these reports to also find keywords that triggered your ad that you would rather have not happen. These keywords that you find are what we call negative keywords for your AdWords campaign. As a heads up, you can also pull a keywords report in Bing Ads too. First, we need to go to Google AdWords and go to the keyword section to start the process. If it is easier, you can watch a quick video below that explains how to do all of this. We want to go to the keywords section in AdWords. We want to click on details and we want to click on all. As a note, I am doing this entire keyword pull from the campaign level. Here, we are now looking a more detailed keyword report in our dashboard. This is some good data, but I want to export the data in excel to learn even more about our campaign. Next, we are brought to an excel spreadsheet of this exact data as above. Here is a screenshot of the data. I recommend adding a filter at the top of the row so you are able to move your data around. This also allow you to sort by cost per click, conversion rate, and much more. Let’s review the data for negative keywords that triggered our ad and cost us money! For this example, I decided to highlight some of the words that I think are bringing in irrelevant clicks for my site. Also, I want to point out that I did receive a lead from the top search term. However, I thought the lead was absolutely crummy and will be adding that to my report to take out. Quickly, I want to explain what negative keywords are. Negative keywords are keywords that we want to tell Google to NOT show our ad when a user searches for that term. If you use this report, you can see what is triggering impressions and clicks (and cost) for your ads. So anyway, I want to break down this excel document a bit. I spent a total of $132.97 on these terms. I did receive 2 leads through PPC, but both leads completely sucked. If I did not pull this report, I would of kept the term that pulled in 2 conversions since at the high level, I would be happy with the leads. When I investigated this further, I realized that not only was the email I got bad, but so was the search term. As another tip, I want to highlight column B. One really important feature with this keyword report is understanding what match type you are bidding on in Google AdWords. If you are running more campaigns or ads with broad match, you will start to see more search terms that are not specifically specific to your ad. What happens is that you will get a lot more impressions, but overall, you will see a decrease in the quality score of that search term. The reason is because that term is irrelevant to your add with low time spent on page, Pogo stick effect, and sometimes, no clicks at all. OK, so I just pulled this excel report. I can see that I am spending some money on crappy clicks. I want to add these terms to AdWords so I can create negative keywords. Google makes this a pretty easy process to about with. At the bottom of the keywords section in AdWords, I scrolled down to the bottom of the page to find the negative keywords option. Next, we want to use our excel document and find any terms that are triggering our ad that are irrelevant. The next question you have to ask yourself is if you want to use the negative keyword for the ad group or the campaign. What this means basically is would you like to exclude this keyword all together or just for that specific campaign. In the video that is at the top of this page, I just put the negative keyword to trigger the entire campaign. One reason that you would not want to do this is if that keyword is suppose to trigger a specific ad group that is under your campaign.